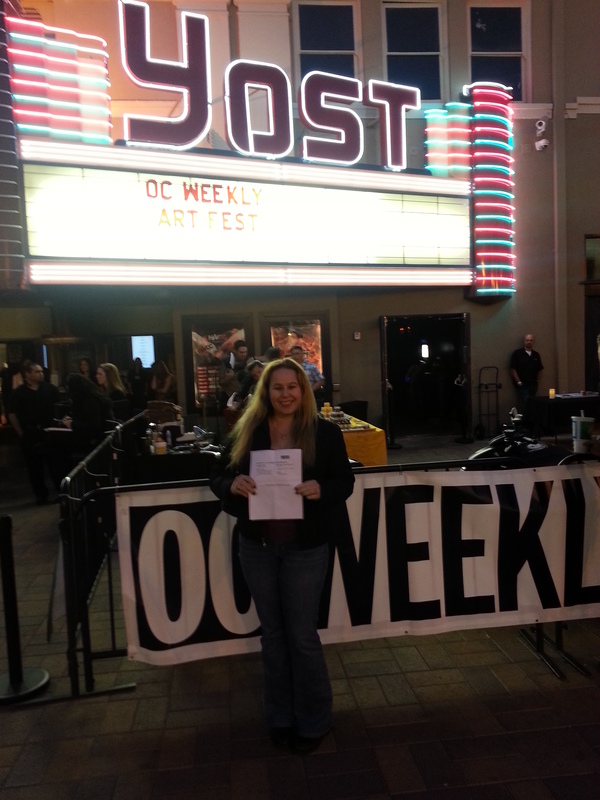 OC Weekly’s First Ever Artopia Event – Food, Culture, and Entertainment!! barber shop with funk & style.” Hawleywood’s Barber shop currently has locations in Costa Mesa, Long Beach, Huntington Beach, and Sydney, Australia. featured was curried vegetable puree with coconut mint yogurt and coconut. My favorite was the one with ricotta & strawberries. Some of the other food and alcohol booths included Hendrick’s Gin which featured a “cucumber gimlet” made with Hendrick’s gin, lime juice, simple syrup and cucumber…yum & the “bee’s knees” with Hendrick’s gin, honey syrup, and lemon juice, Milagros Tequila, Pacifico Beers, pork belly from “The Surfin Cowboy,” Reyka Vodka, and more. Newly Engaged couple at Artopia. Cheers to you both!! Last, but definitely not least, we got to watch an amazing acrobat come out of the ceiling in a sheet/ropey fabric. She was so agile and was amazing to watch as she waltzed around in her sheet to music. See pictures for the fabulous performance. Next Next post: FREE Ben and Jerry’s Ice Cream Cone TODAY April 9, 2013 Only!! Sounds a great event, a little bit eclectic but a lot of fun. Thanks for all the pictures, these are great! Thanks for sharing! Looks like fun was had by all! WOW! Love your pics and article! You always have so much fun! Thanks for sharing! Looks like it was a great event.. but you had me at tequila! Wish you could come to a festival in NY when I am a vendor, take great photos & do a fabulous review like this one. I love reading your posts. Sounds like Artopia was a great success. My husband and I have traveled to Iceland and it is such beautiful country. Great event! Sounds like you had fun Dani! Dani, with your pictures and comments…it’s as if we had been right there with you! Thanks for bringing a bit of the West Coast to my part of the East! Looks like an amazing night out.. and only $10! Your great deals continue to amaze me! Following you around on all your journeys is quite a trip. Sounds like a fantastic event to attend and it looks like you had an amazing time. Thank you for sharing photos of your outing. It looks and sounds like you had a great time at a great event. I think I will go travel with you and discover all your great deals! Wow, looks like fun! You can’t go wrong with art, acrobats and vodka! It sounds like you had a lot of fun, thanks for letting me know about the “Voice Daily News”! How do you find all these deals? Wow!